Hello and Happy Tuesday! It's time for another challenge at Tuesday Throwdown and this week... It's All About the Words. Our sponsor is Craft Classes Online, they offer an array of different crafty classes. I can't wait to see how you interpret this theme. You have until mid-day on Monday, November 14th to link your creation. Click here for all the challenge details and design team inspiration. I sure hope you will play along! This tree stamp by Inkadinkado was the first thing that came to mind when I read the challenge theme. Then I found the Merry Christmas word paper by Pebbles and thought it would work too, so I used both. 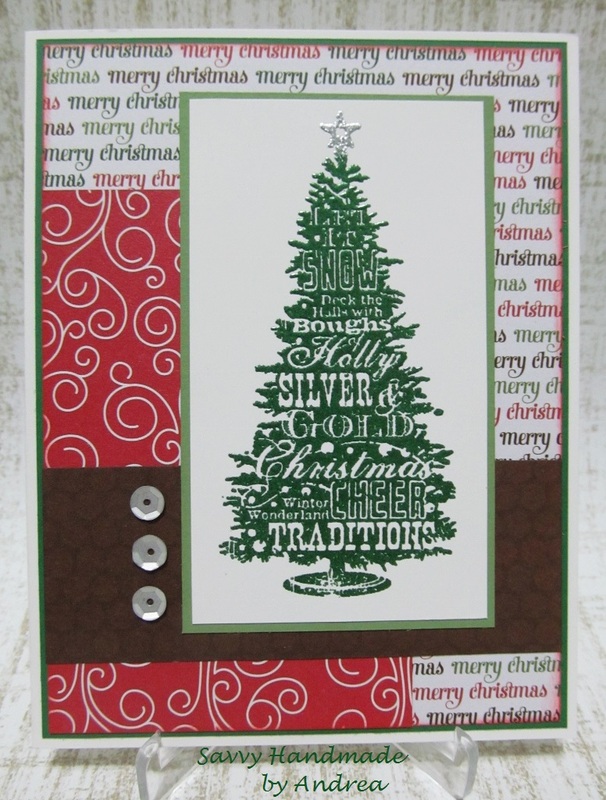 The tree was heat embossed with Emerald PEARLustre and silver glitter powder on the star both by Stampendous. A simple layout and three silver sequins finished the card. Thanks for stopping by and enjoy the rest of your day! I had to stop by and let you know I love your card. It's very pretty. A super creation for our 'Trees' theme at Fashionable Stamping Challenges, many thanks for joining in and sharing your lovely work. 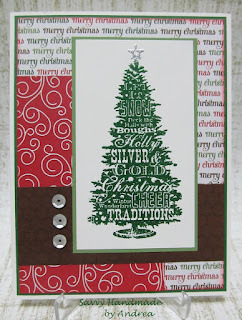 Ooh, the embossed tree looks fabulous! Great card! 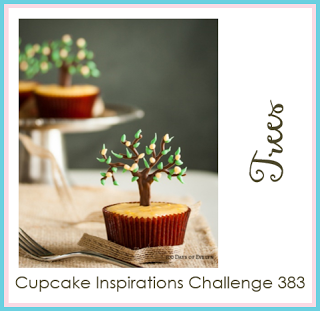 So glad you were inspired this week's Trees Challenge at Cupcake Inspirations! Love this tree stamp! Perfect for our challenge over at FSC! Thanks for sharing. Thanks for playing with us at CraftyHazelnut's Christmas Challenge Extra for November and good luck! What a sweet card! So glad you liked up with the Cupcake Inspirations challenge! That's a gorgeous stamp! Beautiful card! I need to make some more Christmas cards myself! Your use of our ‘tree’ theme is absolutely stunning. Wonderful job this week. Thank you for joining us at Cupcake Inspirations. What a fun stamp to use for this challenge! So pretty! Thank you so much for joining us at Cupcake Inspirations! The graphic is just perfect for the holiday. The card is very nice with all the special touches you add.